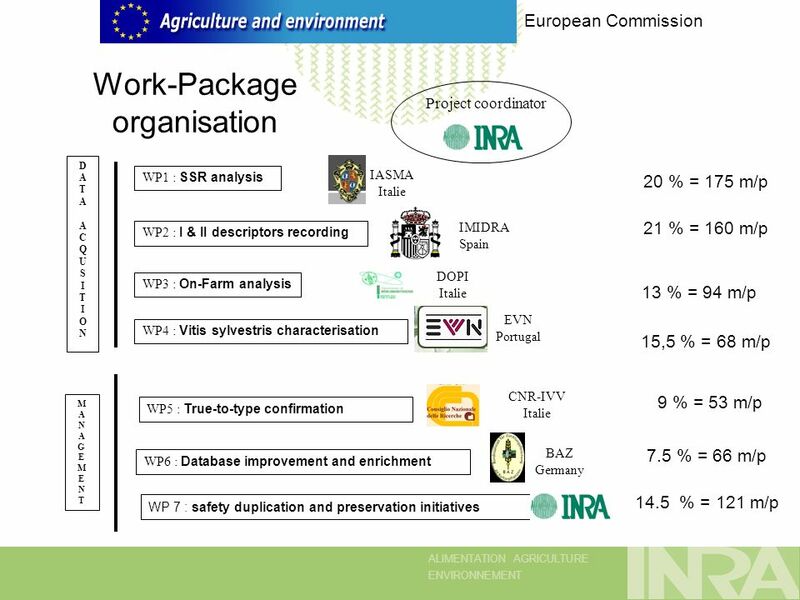 ALIMENTATION AGRICULTURE ENVIRONNEMENT GrapeGen06 Management and Conservation of Grapevine Genetic Resources Jan. 2007- Dec. 2010 A european leading project. 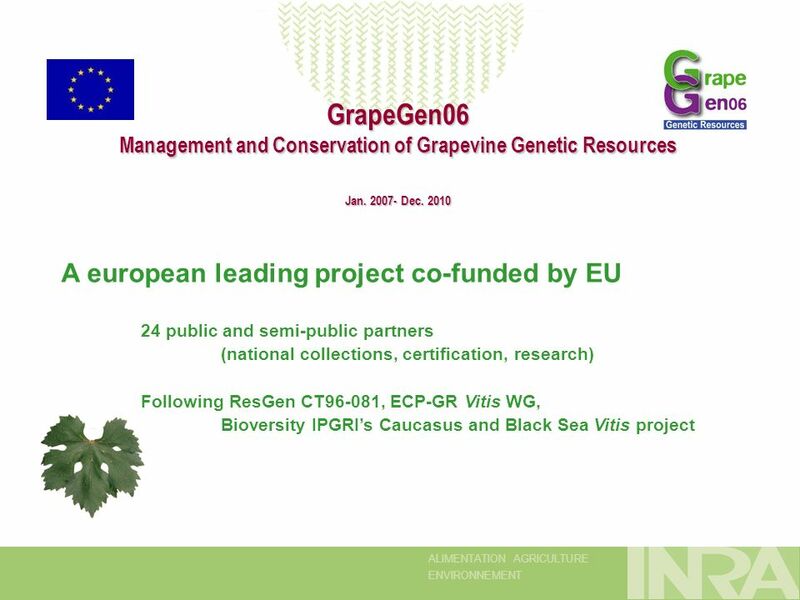 Download ppt "ALIMENTATION AGRICULTURE ENVIRONNEMENT GrapeGen06 Management and Conservation of Grapevine Genetic Resources Jan. 2007- Dec. 2010 A european leading project." 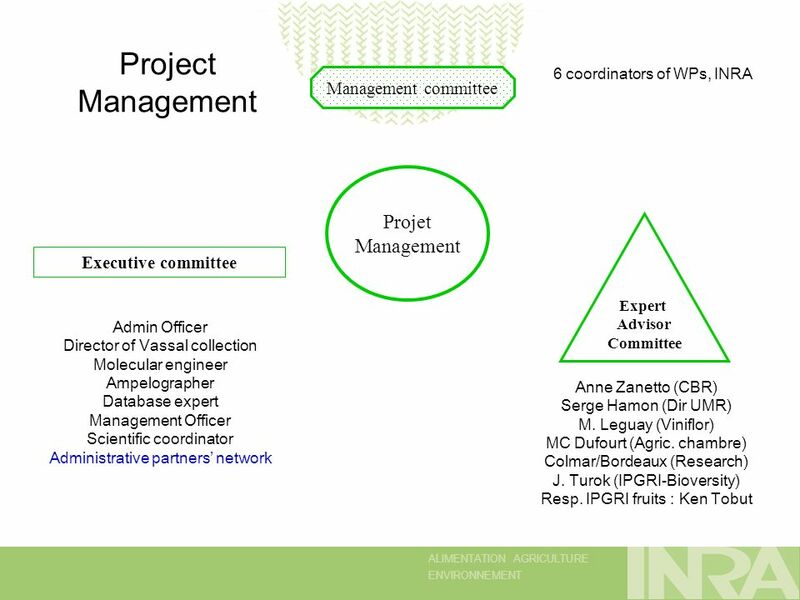 Potential for Collaboration between EUCCONET and other European Projects Martine Vrijheid EUCCONET Workshop Feb, Paris. > Contents 1 10/12/2007, Lead applicant seminar, Katowice, Poland EUROPEAN REGIONAL DEVELOPMENT FUND Preparing an INTERREG IVC application: Financial and. 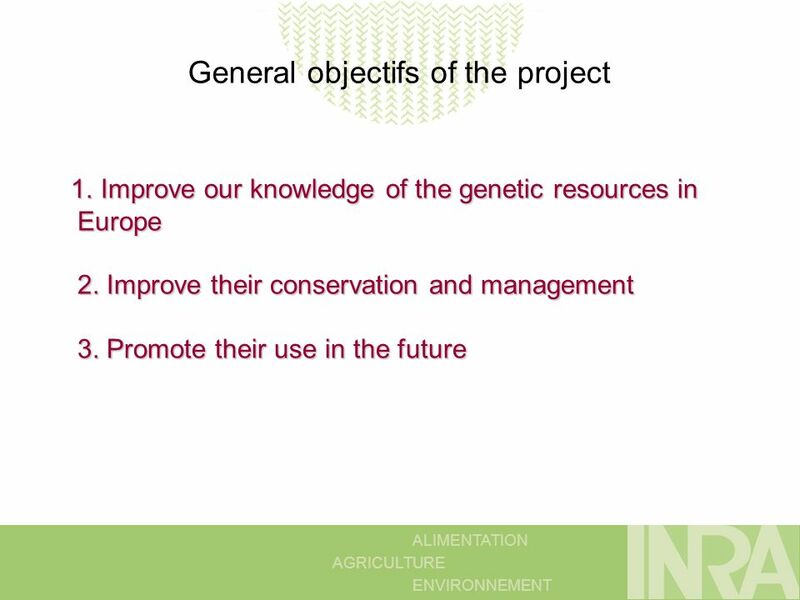 ALIMENTATION AGRICULTURE ENVIRONNEMENT GrapeGen06 Management and Conservation of Grapevine Genetic Resources Jan Dec A european leading project. World Class Standards Introduction to ETSI ETSI Seminar for Turk Telekom Dr. Hermann Brand ETSI NIM © ETSI All rights reserved Ankara, May. Health in Prisons Project Establishing a Monitoring Mechanism on Prison Health Indicators and Health Determinants Working Party on Information on Lifestyle. 1YMLP-D Introduction to the FutureNEM project D2 Concertation meeting Brussels- 3-4 February 2010. The European Law Students Association Albania ˙ Austria ˙ Azerbaijan ˙ Belgium ˙ Bosnia and Herzegovina ˙ Bulgaria ˙ Croatia ˙ Cyprus ˙ Czech Republic. BAU 2011 Europe’s building industry after the crisis – What now? Erich Gluch ifo Institute for Economic Research, Munich BAU Information Talks on 28 October. 1 14 th May 2008 How can pan-European Public Services Benefit from CIP ICT PSP Pilot on eID Dr. Davorka Šel Ministry of Public Administration SLOVENIA. Wild Grapes in Georgia G. Nakhutsrishvili, Zh. Ekhvaia, M. Akhalkatsi, T. Beridze N. Ketskhoveli Institute of Botany, Tbilisi, Georgia 1. 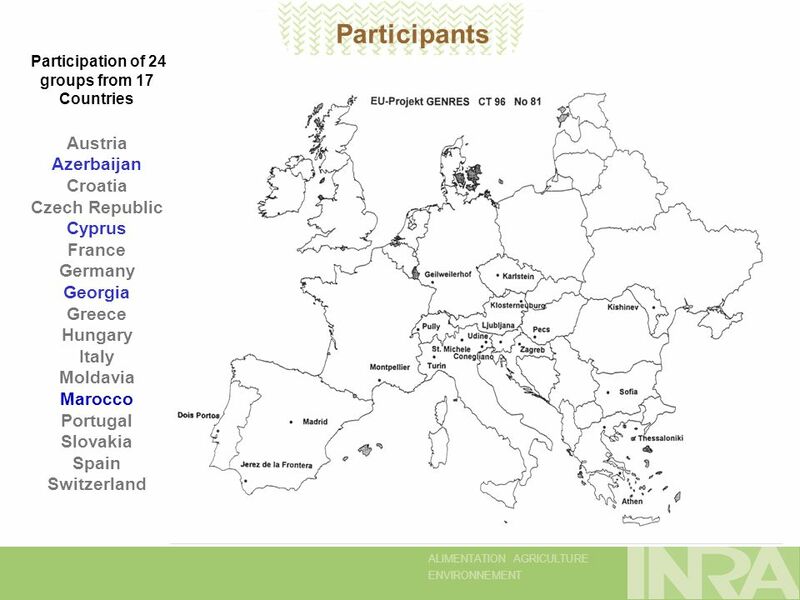 Delegations ICM Cluj-Napoca, 20th April The European Law Students’ Association Albania ˙ Austria ˙ Azerbaijan ˙ Belgium ˙ Bosnia and Herzegovina. Knowledge Management LXV International Council Meeting Qawra, Malta 16 th - 23 rd of March 2014. Study Visits ICM Croatia, Opatija, 27th October to 3th November 2013. Institutional Visits IV KAM Prague, 3 rd to 7th September.